We have implemented a new virtual cursor for the in-game mobile phone in Paralycid. This is going to be a technical post about how we changed the control mechanism of our phone interface in Paralycid; our horror and adventure game. You can find the demo project here. I assume that you have basic knowledge in Unity and its UGUI system. First of all, I will give you some information about our game. It is a fact that flashlights, lanterns, torches etc. are used a lot in horror games. Instead of using a flashlight or a lantern, our female protagonist carries her most valueable thing with her: a phone with various features such as dialing, messaging, navigation, flashlight etc. It's like a real smartphone. The phone has a very important place in the game as it is directly connected with the puzzles. Therefore, accessibility and ease of use is one of the most important things for us. For the "easy to use" part, we tried to control the phone with the arrow keys, "backspace" and "enter" keys on the keyboard. The player was using the arrow keys to navigate the menu, "backspace" to return and "enter" to select. However, this approach had a major disadvantage. The player had to switch from mouse to the keyboard whenever he/she wants to use the phone. At this step, you won't be able to interact with the ui elements on the quad object. Let's find out why. If you click to the EventSystem object, you will see that there are two components attached to this object: EventSystem and StandaloneInputModule. These are two main components/scripts that are responsible for the interaction in a scene. The EventSystem is responsible for processing and handling of events. And StandaloneInputModule is responsible for listening to input events coming from the mouse, keyboard, and touch screen. For information about input modules please read here. 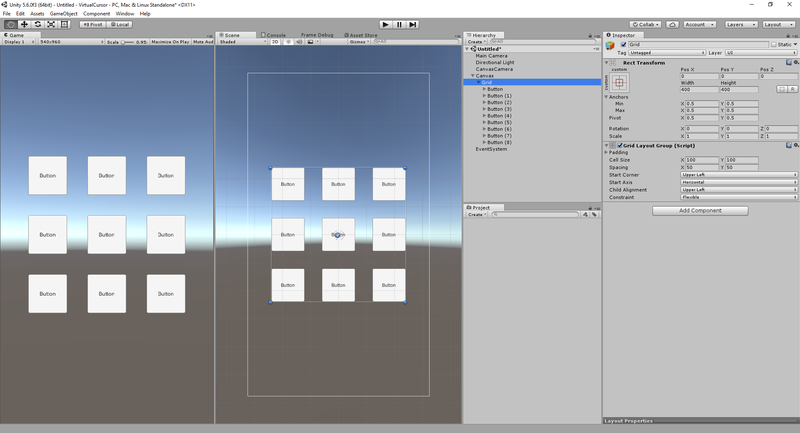 VirtualInputModule will share most of its code with StandaloneInputModule and it will also extend Unity's PointerInputModule. 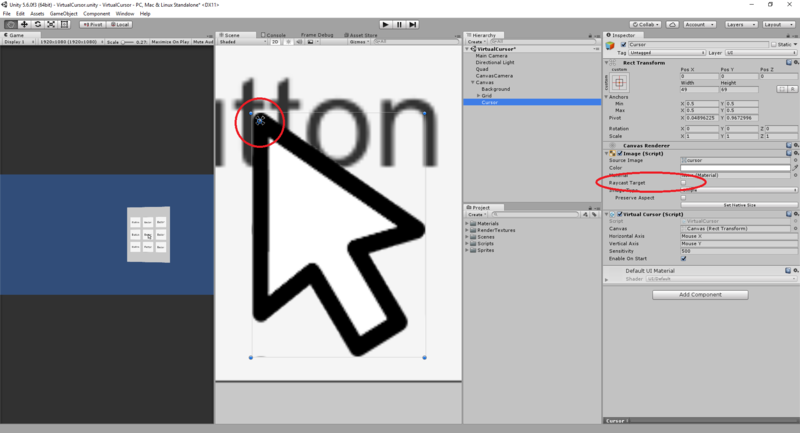 The difference will be using the position of our cursor image instead of using the position of default cursor while checking the cursor interactions. 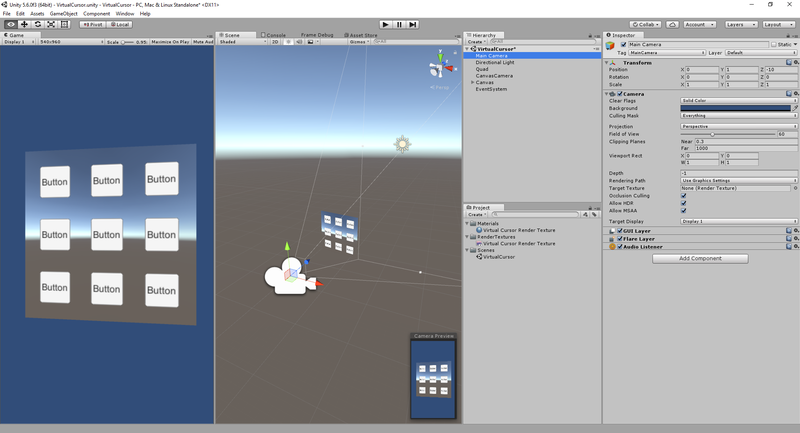 To do this, we need to download the StandaloneInputModule class at relevant branch from the Unity's bitbucket page (it can be found under this path: UI/UnityEngine.UI/EventSystem/InputModules/), rename it as VirtualInputModule and change all input.mouseposition with the position of our custom cursor. PointerInputModule.GetMousePointerEventData() method also uses input.mouseposition so you may want to override this method with your own implementation thet uses the custom cursor position. I've set the highlight color to red, and pressed color to blue.